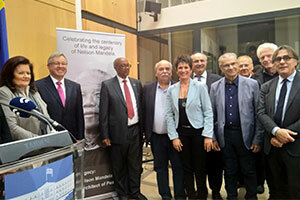 On 27 November 2018, the President of the Hellenic Parliament, Mr. Nikolaos Voutsis, together with the Ambassador of South Africa, Marthinus van Schalkwyk, hosted a special event to celebrate the 100 year anniversary of the birth of Nelson Mandela. The commemoration was attended by the Deputy Foreign Minister Mr. Markos Bolaris, MPs, Ambassadors, prominent business-people, famous artists and celebrities, and friends of South Africa. In his welcome, Mr. Nikolaos Voutsis, President of the Hellenic Parliament, spoke to the packed room about the relevance of Mandela’s legacy to the world, especially the challenges Europe is facing today. The Ambassador of South Africa to Greece, Marthinus van Schalkwyk, highlighted the new dawn in South Africa under President Cyril Ramaphosa and the unique attributes of leadership that made Mr Mandela great, especially his human touch and his ability to inspire us to imagine and fight for a better world. The evening also included readings from "The Prison Letters of Nelson Mandela" by the famous actor and theatrical Director, Dimitris Lignadis, and the renowned branding strategist, Peter Economides, and concluded in a very poignant way with a stirring recitation of the poem "Ode to Nelson Mandela" by the celebrated Greek poet Dimitris Iatropoulos, followed by a tasting of South African wine.